An activist collective opposed to the construction of the controversial Belo Monte hydroelectric dam [en] on the Xingu River in northern Brazil uncovered a spy in its midst [en] who confessed to infiltrating the group allegedly at the behest of the dam company and Brazil's federal intelligence agency. The Movimento Xingu Vivo Para Sempre (Xingu Alive Forever Movement), a collective of organisations, social movements, and environmentalists in the region of Altamira, Pará that are against the power plant there, which is currently under construction, discovered the mole during an annual planning meeting on February 24, 2013. Em dezembro [de 2012], segundo o depoente, ele passou a espionar o Xingu Vivo, onde se infiltrou em função da amizade de sua família com a coordenadora do movimento, Antonia Melo. Neste período, acompanhou reuniões e monitorou participantes do movimento, enviando fotos e relatos para o funcionário do CCBM [Consórcio Construtor de Belo Monte], Peter Tavares. Foi Tavares que, segundo Antonio, lhe deu a caneta para gravar as discussões do planejamento do movimento Xingu Vivo. O espião também relatou que este material seria analisado pela inteligência da CCBM, e que, para isso, contaria com a participação da ABIN (Agência Brasileira de Inteligência), que estaria mandando um agente para Altamira esta semana. In December , according to the man, he began to spy on Xingu Vivo, which he infiltrated based on his family's friendship with the coordinator of the movement, Antonia Melo. During this period, he followed meetings and monitored the movement's participants, sending photos and reports to Belo Monte's Consortium Builder (CCBM) employee Peter Tavares. Tavares was the one who, according to Antonio, gave him the pen to record Xingu Vivo's planning discussions. The spy also reported that this material would be analyzed by the CCBM's intelligence, and for that he'd count on the participation of the Brazilian Intelligence Agency (ABIN), which would be sending an agent to Altamira [that] week. The movement asked federal prosecutors to assure the spy's safety and of the members of the Xingu Vivo, who say they feel “in a situation of risk and under threat”, besides asking for the investigation of the complaints. In a brief statement [.pdf], ABIN denied any involvement in the espionage in conjunction with the CCBM. CCBM has not released any statement. ABIN, established in 1999 as an instrument of the federal government, was appointed as the successor of the National Intelligence Service, an agency that actively spied on popular and labor organisation during the Brazilian military dictatorship from 1964-1985 in order for them to be better controlled or even crushed. O relatório sigiloso da Abin é “patético” porque as verdades que ele arrola “são mais do que públicas”. Estão no sítio web do Movimento que são seus parceiros e apoiadores. “Não precisava o governo gastar dinheiro dos contribuintes com essa “investigação’”, diz nota do Xingu Vivo. “Constrangedoras, porém, são as mentiras pelas quais o contribuinte também paga”, agrega. O Movimento desafia a Abin a comprovar que recebe apoio de governos. The confidential ABIN report is “pathetic” because the truths which it lists “are more than public.” They are [stated] on the website of the movement as its partners and supporters. “The government didn't need to spend taxpayers money with this “investigation”, says the Xingu Vivo note. “Embarrassing, though, are the lies by which the taxpayer also pays”, adds. The movement challenges ABIN to prove that they receive support from governments. Several organisations and social movements have signed a joint statement condemning ABIN and expressing solidarity with the Xingu Vivo movement. A espionagem dos movimentos populares e sindicais não é exclusividade dos regimes militares. Em realidade, nunca foi erradicada, já que a “transição democrática” de 1985 manteve a maior parte dos privilégios dos militares e políticos ligados à ditadura. De uma só vez, a serviço dos empresários e do imperialismo, o governo do PT dá espaço para a ala direita da burguesia, que sempre esteve no comando dos órgãos de repressão, fazer o que bem entende contra o povo trabalhador. The espionage of popular movements and unions is not unique to military regimes. In reality, it was never eradicated, as the “democratic transition” from 1985 retained most of the privileges of the military and politicians linked to the dictatorship. 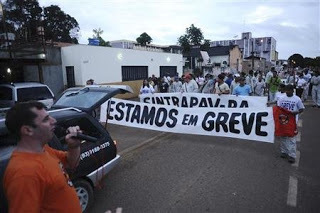 At one time, at the service of entrepreneurs and imperialism, the government of the Workers Party (PT) gave space to the right wing of the bourgeoisie, which has always been in control of the organs of repression, do what it pleases against working people. Além do trabalho voltado a salvaguardar os conhecimentos de interesse estratégico para o Brasil, a Abin assessora a Eletronorte na elaboraração do planejamento estratégico de segurança para a proteção de suas infraestruturas críticas – instalações, serviços e bens que, se forem interrompidos ou destruídos, provocarão sério impacto social, econômico e/ou político. In addition to the work aimed at safeguarding the knowledge of strategic interests for Brazil, Abin advises Eletronorte in the development of strategic security planning for the protection of their critical infrastructure – facilities, services and assets which, if disrupted or destroyed, would have serious social, economic and/or political impact. But this is not the only construction site where opposition to governmental projects has allegedly come under surveillance by the Brazilian Intelligence Agency. 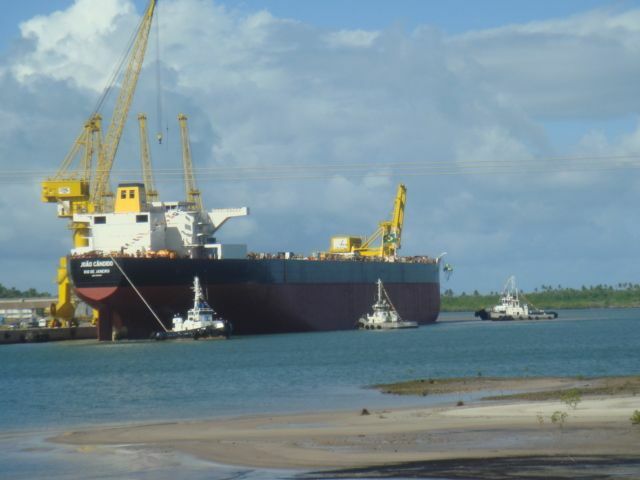 The agency faces allegations that it has also spied on workers at the port of Suape in the northeastern state of Pernambuco, in the city of Cabo de Santo Agostinho near Recife. The Provisional Measure of Ports, MP 595/12, a proposed Presidential act, provides for, according to various social movements, the privatization of Brazilian ports. Blogger José Accioly republished a note by the Institutional Security Cabinet (GSI) – which coordinates ABIN's investigations and responds to the Presidency of the Republic – rejecting the accusations that it was spying on the union movement of Suape. But secret documents from ABIN, obtained and published by Brazilian news website Estadão.com.br, confirmed that it was monitoring the unions. Operation “Risk Management”, formally known as the Office “Mission Order 022/82 105″ of March 13, 2013, not only disavows the GSI, reporting that the espionage occurs in all 15 coastal Brazilian states and its ports in order to avoid strikes and negative reactions to the Provisional Measure of Ports. O clima que os opositores ao regime vivia, era o mesmo clima que os opositores do poder da República vive hoje. Não sabemos de onde virão as represálias, porque estamos sendo monitorados, sim. Os achincalhamentos que recebemos, via rede social é a parte visível do processo. O que temo são as ações desenvolvidos pelos órgãos de inteligências contra os opositores do regime de hoje, pelos agentes invisíveis aos olhos do cidadão comum. The climate that opponents of the regime lived through, was the same as opponents of the Republic's power experience today. We do not know where the retaliation will come from because we are being monitored, yes. The mockeries we receive via social network is the visible part of the process. What I fear are the actions undertaken by intelligence agencies against opponents of the regime today, by the agents invisible to the eyes of the average citizen. Even employees of ABIN, represented by the National Association for Intelligence Officers (Aofi), reported in a note that they feel uncomfortable with the focus put on spying on social movements under General José Elito. The union Força Sindical issued a statement declaring it unacceptable that a party with its origins in the labor movement can use “organs of repression” against these workers. OLHA SÓ O QUE OS ESTADOS UNIDOS FAZEM COM SUAS FLORESTAS!! Pingback: How far should the government go to protect citizens? | Big Brother: Can Siblings Get Along?